May 30, 2017, 6:33 AM · In an effort to promote the coverage of live violin performance, Violinist.com each week presents links to reviews of notable concerts and recitals around the world. 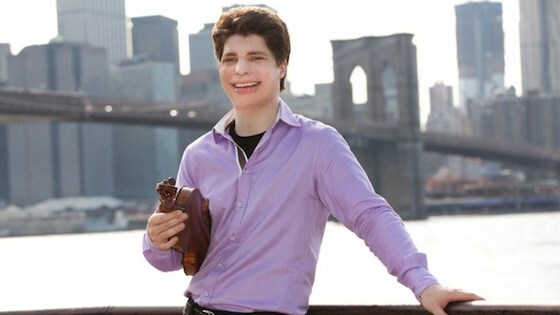 Augustin Hadelich performed the Dvorak with the New York Philharmonic. The New York Times: "At 33, Mr. Hadelich increasingly seems to be one of the outstanding violinists of his generation." New York Classical Review: "He perfectly captured the spirit of the piece, from the earnest sighs of the Adagio to the bouncing celebration of the Finale." Benjamin Beilman premiered Ogonek's "In Silence" with MusicNOW. Chicago Classical Review: "The work is a violin concerto in all but name, cast in the traditional three movements and spanning 35 minutes.... While playing with great warmth of tone, Beilman was alive to the mercurial qualities and handled the bravura breakouts with unruffled flair." Chicago Tribune: "Beilman brought an especially winning personality to the variations, a kind of demented scherzo (marked "light, scurrying, goofy") of leaping figures and disjunct meters." Elena Urioste performed the Tchaikovsky with the Williamsburg Symphony Orchestra. The Virginia Gazette: "I must declare that the Tchaikovsky, at Urioste's talented doing, was extremely exciting. In fact, competitively, it was one of the most energetic and sensational live performances you'd want to hear, anywhere." Simone Porter performed Mozart's Violin Concerto No. 3 with the San Diego Symphony. San Diego Reader: "Violinist Simone Porter played Mozart's Violin Concerto No. 3 with a beauty of tone which was equal to the stylistic perfection being pulled out of the orchestra by Dutoit. The famous second movement had just the right amount of suspension and grace." Esther Yoo performed works by Mendelssohn, Debussy, and Tchaikovsky in recital with pianist Robert Koenig. South Florida Classical Review: "Yoo displayed impeccable technique, highly personal interpretive instincts and musical maturity far beyond her years." May 30, 2017 at 02:50 PM · I didn't know the second movement of Mozart No. 3 was "famous."